in a market almost suffocating with carbon fibre, what brought you to introduce aszure to the world? Aszure was borne out of the rather romantic idea of cyclists making bikes for cyclists. The development team all ride and race bikes passionately and we have seen good and bad points from many different stables. We knew that we could make a bike that rides better than anything on the market at the same price point. We feel there are a lot of 'gimmicky' ideas floating around and wanted to cut through this and focus on what makes a bike great. We haven't cut any corners, if you look at the bars, stem, seat post you'll see they are higher quality than anything on a similar bike. Our saddles were commissioned from Prologo especially for Aszure and even down to the tyres we fit onto our Mavic wheels, we wanted to have quality throughout. This has squeezed our margin a little, but we genuinely believe the way forward is to provide a quality bike with quality parts... right down to the bar tape. Now I know you could upgrade anything on the bike to some kind of exotic equipment, but there is nothing on the Team Issue bikes that would be out of place in a Pro Peloton. We also want to protect the brand and make sure our bikes are sold by people who care about cycling. This may sound like something everyone says, but we really are passionate about our bikes and the sport. Launching a carbon bike into the market is crowded, but there aren't that many bikes that have the quality running through that we do at our price point. We are confident that this, combined with our customer service will create a winning combination. It will not happen overnight, but we will get an association with quality. what were the principal concerns when designing the team issue frameset? We looked at the geometry firstly, and wanted to create something that would allow an aggressive position for a faster ride. But we also understand the importance of getting the correct carbon layup. We sourced the highest quality high modular carbon fibre we could from Mizuno and tested various frame set-ups to create a ride that is aggressive, yet comfortable. This again is something you need to experience. There are many manufacturers of carbon bikes, but we are new to the market and wanted to become known for quality. As a racing cyclist myself I know that position is important, but so is lateral stiffness. We decided to go for an integrated bottom bracket to allow a little more carbon lay up and beef up the downtubes to aid power transfer to the back wheel. Doing this allowed us to reduce the size of the seat stays, which we feel adds to the aesthetics of the bike. is it ok if we refer to it as az-your-ay? I think as with a name like ours, it will be pronounced a number of ways. The name is actually a play on words between Assure meaning the bikes are strong and reliable and Azure, a delicate flower. Azure flowers also produce an acid that can be used to clean rust from metals and heal wounds. The combination of words into Aszure is then emblazoned on our bikes that is strong and reliable yet very delicate and attractive in appearance. 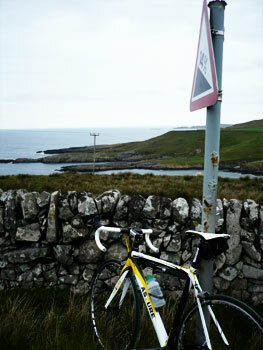 one of my more visible criticisms of the frameset was the yellow and black colour scheme. how did you arrive at these colours/design. 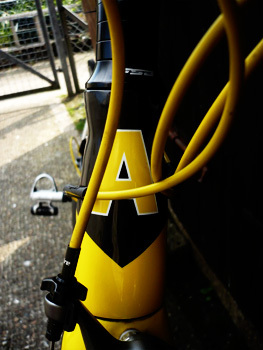 The yellow and black colour way was down to the Team Issue being ridden by Team Sportscover. Being completely open here, we are a new company and to make a full range of colours in year one was difficult. We made the bikes to fit in with the teams corporate appearance. I think the design is down to personal taste... a bit like Marmite; love it or hate it. However, the aesthetics of the frames are something we are considering. 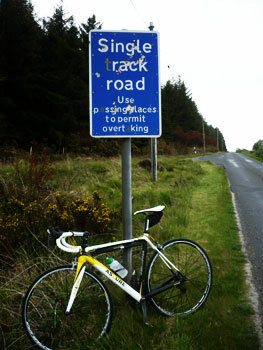 Our Sprint range is blue and black and the TT bikes are black with a flash of white. We are speaking to the consumers all the time and taking the market's comments on board for our development of frames. 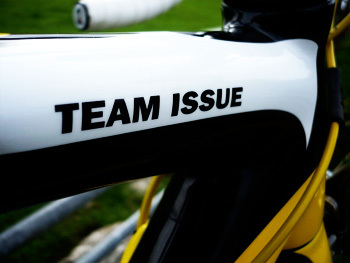 is the team issue crafted as a pure race bike or are there other strains at work? Whilst it is designed as a race bike with the Sprint being a more forgiving ride, the quality and lay up of the carbon ensures comfort. Initially we expected the bike to only appeal to racers, but we have let people test/demo the bikes and we have sold bikes to folk who are riding for fitness and also the sportive market. This is an area, as you know, that is booming and there are many sportive riders who are looking for responsive rides and we seem to tick all the boxes. The difficulty is, as already discussed, is aesthetics. We know we will never please everyone. can you describe the typical aszure team issue rider? The Aszure rider is a cyclist who is looking for quality and attention to detail. They understand bicycles and can see beyond the marketing hype, and demand a bike with an incredible ride. When looking at a new bike they want a frame that is stiff and responsive, but will also want to be part of our purist view and passion of the sport. In riding Aszure bikes they will feel proud to be on a bike designed and assembled in the UK, delivered and sold by the team who have been involved in its production from end to end. Most of our customers have been very interested in our process and tend to research their new bike purchases with a great level of detail. is the quest for perfection ongoing, or has satisfaction been achieved for the time being? Always. We want to make the best bikes in the world. We are extremely happy with Aszure, but I don't think we will ever be satisfied. The day we are is the day we stop making bicycles. it occurs that the frame could stand to lose a few grams. is this something under consideration, or do you feel that weight, at this level, is over-rated? Our Team Issue bike with Dura Ace is only just inside the UCI legal limit, and with a pair of lightweight carbon wheels will push the scales very close to being illegal in competition. We believe that the ride quality of bikes can be compromised by weight. As a cyclist I know that the places to lose weight in a bike are from moving parts (tires, wheels, pedals etc). We are not aiming the bikes at the elitist cyclist who wants a 12lb bike costing £15,000. Our bike is ridden by enthusiasts who want a bike that does the basics very, very well. the component package seems particularly well thought through. is this something that occupied considerable deliberation? Yes, as described above. The components are very important and we spent a lot of time travelling around the major suppliers. As a new brand we understand the importance of familiarity. Cyclists can be fickle and having the best components on the bikes makes them very attractive to our target market. You wont find own brand brakes, bars, stems etc. We are new, we do what we do well and use world leaders for those items we don't specialise in. Anything else can lead to a jack of all trades approach which would not give the result an Aszure customer will expect. is the price point (of the ultegra equipped model) something you were specifically aiming for? was price uppermost in your mind at the design stage? At £2,600 the Aszure Team issue with Ultegra is a great bike that would meet the demands of a top end racing cyclist, but at a "reasonably" affordable price. £3,300 sees the bike come with Dura Ace and Mavic Ksyrium Wheels. Our Sprint starts at £1,600 through to £2,000 for 105 and Ultegra respectively. Our bikes need a place in the market, and we looked at the competition and the ever escalating prices of bikes and made sure that we could offer a bike at a competitive price without compromise. Anyone who compares our bikes against others will identify the superior build spec immediately.